Sam Harris, one of the four “horsemen” of New Atheism, published a book delineating his position on moral realism (whether objective moral values exist and how can we know them). Its central claim is that being moral entails trying to maximize the aggregate “well-being” of sentient beings. So, claims about the morality of actions reduce to statements about how those actions affect the mental states of creatures, and thus can be verified scientifically. His work has been reviewed and critiqued quite well by academics across fields including philosophers Russell Blackford, Massimo Pigliucci, Thomas Nagel and physicist Sean Carroll. The general opinion seems to be that he unsuccessfully tries to derive an ought from an is, and defines “science” too broadly in order to justify an attractive subtitle for his book (“How Science can Determine Human Values.”) I have already written about naturalists’ attempts to ground morality, and thus will not attempt to point out all the flaws in Harris’ line-of-reasoning. Instead, I would like to focus on a novel analogy he provides between the science of medicine and an objective system of morality. …Can we not even imagine people with fundamentally incompatible views of the good? (I think I can.) And if we can, what is the reason for the cosmic accident that we all happen to agree? And if that happy cosmic accident exists, it’s still merely an empirical fact; by itself, the existence of universal agreement on what is good doesn’t necessarily imply that it is good. We could all be mistaken, after all. Our system of medicine makes claims of the sorts, “If you value living longer, don’t smoke.” It does not say that you ought to value living longer, but it tells those who do what to do to achieve that end. On the contrary, morality is not about making “ought” statements contingent on a person’s wishes or values. Rather, it’s about claiming what people ought to value regardless of what they already happen to value. For every statement like “if you value seeing other people happy, donate to a charity” there can be an analogous statement “if you value killing people, purchase a grenade and drop it in a mall.” Any meaningful system of morality needs to tell us why valuing other people’s happiness is objectively better (or worse) than valuing killing people, instead of just making recommendations about how to fulfill our already held values to a maximum. “Oughts” of the sort, “if you value X, you ought to do Y” simply aren’t valuable in answering questions about morality. One of the main challenges of metaethics and moral philosophy is about trying to find out what is the proper conception of “good.” Once that’s established, finding out ways to maximize that “good” is, I dare say, comparatively trivial. If Harris really wants to make a case for moral realism, for why some people’s conception of morality is wrong, he needs to tell us why his conception is correct. It is not enough for his “science” of morality to prescribe how to maximize aggregate well-being. It needs to tell us why that is the proper goal of morality. † Consider this: two persons build two different sciences of morality: science of morality A whose aim is to maximize aggregate well-being of sentient creatures, and science of morality B whose aim is to maximize some other variable X, let’s say a particular person’s well-being (it’s not hard to think of many such variables). The big question still remains: prescriptions of which science A or B should you follow? †† Many people who defend Sam’s analogy assert “just like there can be objective claims about health, there can be objective claims about morality.” There is a genuine confusion underlying it. The term health is analogous to well-being, rather than “morality.” The analogous (and correct) assertion is “there can be objective claims about well-being of sentient creatures,” which is irrelevant to a discussion about morality because a claim about well-being isn’t a moral claim per se. 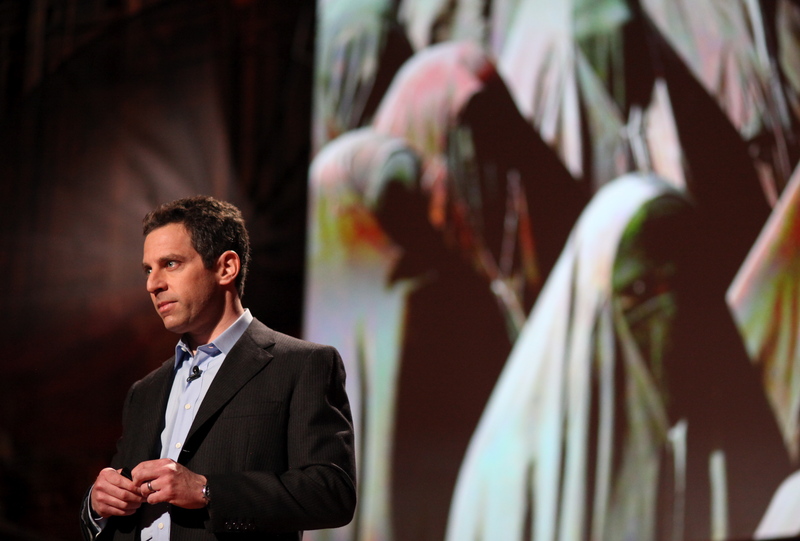 The photo of Sam Harris belongs to Steve Jurvetson and is used under CC BY 2.0. Harris’ response (if he were speaking entirely frankly and clearly) would be: The very idea of a ‘binding’ morality is either a confusion or a fiction. If my use of the word ‘morality’ makes it easier for us to sidestep talking in terms of it, all the better. Agrippa’s trilemma shows that (as a matter of logic) we can’t have a ‘binding’ set of justifications for anything, in any field, ever. Truths of mathematics, science, logic, and daily life are all dependent on assumptions that cannot be non-circularly justified. There is no reason to expect morality to be any different, and there never has been any such reason. So if you demand that morality be different in this respect, then, OK; you define ‘morality’ in such a way that all moral statements are false (or meaningless). But that seems linguistically cumbersome, when we have all these handy words like ‘good’ and ‘ought’ that mirror the structure of some very important real-world properties we urgently need to be talking about in order to evaluate and promote policy decisions. So I humbly dissent from that use of the word ‘morality’. For practical purposes, the important question is not ‘Is there some mysterious platonic Goodness that makes us Objectively Justified in adhering to claim X?’ Rather, the important question is ‘What real-world impact will X have on the things I (or my community) care most about?’ If philosophers want to make the world a better place, they need to worry less about Objective Justification and more about the cash value of different kinds of justification in the goals and experiences we actually have. Peterson route to the definition of God and regarding him as a set of stories constructed for an evolutionary purpose may be useful, sure, but it has none of the significance the past conversation has, and calling yourself a ‘theist’ because of belief in that god is not only going to confuse all of the people you’re talking to but destroy the terminology. It would be better just to make new words, as that’s not particularly difficult. Well, then why aren’t people who have a different set of moral premises (like me) than Harris entitled to their own “sciences” of morality? It’s okay as far as Harris calls the science he develops (or proposes to develop) the science of maximizing utility or well-being. He can simply convey the results of that science as “Y’s act X is causing a major decrease in aggregate well-being.” Words like “ought” (it seems to me) should be reserved for people expressing beliefs borne out of their personal moralities. Since there is so much disagreement (in practice), it’s better to not form a science of morality on one person’s choice of moral premises. It’s better to be more clear and say “this is what you can do for maximizing well-being” and let people decide for themselves. Why was ethanol a non-issue for “rigged economy” liberals?